Ryan takes readers into the world of the young poet who would become the Chilean Nobel Prize winner, Pablo Neruda. At first, it seems that Neruda’s early life would not make for a compelling middle grade novel, but that idea changes after reading the first few pages of this imaginative and beautiful novel. As The Dreamer begins, Neftali Ryes, the future Pablo Neruda, is eight-years-old. My heart broke as I read the early chapters. Neftali loves words and nature, but his father does not understand his creative and sensitive son. There is a particularly heart-wrenching scene where Neftali’s father forces him to learn to swim, and I found myself wanting to jump back in time and pull Neftali out of the waves. Of course, Neftali’s passion can not be quenched by his difficult father, and he follows his dream to become a writer. The book is enhanced by Peter Sis’s drawings. His surreal images convey Neftali’s inner turmoil, and make the story even richer. This is the perfect book for a young writer. I know several students that would be inspired by Neruda’s story, and I’m going to put a copy in their hands as soon as possible. 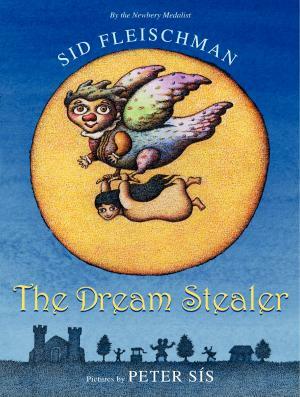 I read a delightful short chapter book today by the prolific Sid Fleischman. 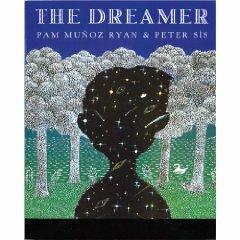 The Dream Stealer is a Mexican-flavored tale about a sprite (of sorts) who is supposed to “catch” bad dreams, but what really caught my attention were the illustrations by Peter Sis. They are simultaneously delightful and scary. This would be a good books to hand to the third or fourth grade student who is beyond the Magic Tree House series, but not quite ready for longer novels. Happy Holidays and Happy Reading!